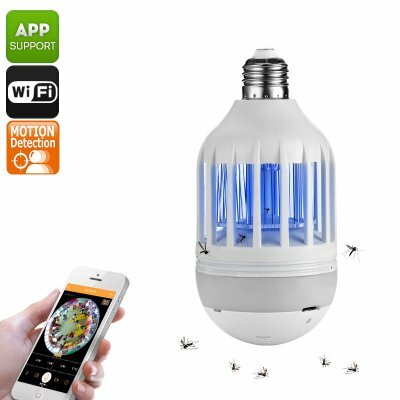 Successfully Added IP Camera - Light Bulb Design, Bug Zapper, Motion Detection, App Support, 128GB SD Card Recording, 960p, 120 Lumen LED to your Shopping Cart. This cool electronic gadget is so much more than your regular bug zapper. Within its body, you’ll find an intergraded HD IP camera as well as 4 bright LED lights. Thanks to its multi-purpose design, the gizmo helps you to get rid of mosquitoes, light up your porch, and increase your home security at the same time. The intergraded LED lights put forth cool white 120 lumens light at a 360-degree angle. Being capable of lighting up a 20 to 50 square meter area, it is great to be used on your porch, balcony, or hallway. The gadget features an E27 socket, this bringing along great efficiency and easy installing. With its intergraded HD IP camera, this bug zapper allows you to keep track of all that’s happening around your home. The camera supports a 185-degree lens that makes sure that there won’t be any blind spots for possible intruders to hide. Thanks to its high-end CMOS sensor from Sony, this WiFi IP camera puts forth crisp 960p footage that makes it easy to identify visitors and possible intruders. Thanks to its APP support, up to 8 online visitors can access your camera’s live view at once. By supporting 128GB SD card input, this WiFi security camera allows you to instantly store security footage to be analyzed at a later time. This WiFi IP Camera comes with a 12 months warranty, brought to you by the leader in electronic devices as well as wholesale security cameras..